Glendale Police Chief Steve Conrad notified Thomas and his (sometimes subordinate) girlfriend at work, Officer Heather Opp, that they were to be fired, so they resigned. Oregon police responded to [resigned Glendale police officer Bremt] Thomas's new home early Sunday after a caller reported he had assaulted his girlfriend. They arrived to find his 27-year-old girlfriend's face covered in blood and her eyes swollen, according to a probable cause statement filed in Lincoln County Circuit Court. He reportedly grabbed the woman by the throat when she tried to get money from a safe and later punched her "multiple times in the face and head"... Police responding to the couple's home also discovered dozens of loaded firearms including AR-15 rifles and semiautomatic handguns. A July 2010 order of protection bars Thomas from possessing guns... Thomas was arrested on suspicion of 71 counts of contempt of court for possessing firearms in his home, as well as felony assault, menacing, strangulation and harassment. You have no clue of the complete facts in these cases and this is slanderous! News excerpts are slanderous? Interesting. slanderous??? really??? the facts about this story are true; trust me i know; so next time think before you speak. If you know so much, you must be a eye witness. I would hope you have contacted the investigating police agency. The actual facts are very questionable but why not try the man in the media. BTBW - Do you have an update on this story? Any latest developments? Thanks for asking. Caused me to look and see. Yes, something did happen. I have to run but will post. He should be under a jail - and is not. What a deal!!!! Updated: 9:37 am, Fri Jul 29, 2011. Shocked to say the least!!! I've known this guy for years and he was always an a**hole to deal with. I've seen him have tantrums and have witnessed him browbeat his wife in public. It was only a matter of time before this happened. The articles fail to mention that he shot an unarmed man in Glendale in 2008. Where ever this guy is you can bet that he has guns with him! there is nothing going on with this case. It is at a stale mate and may be dismised!! After seeing both the photos and hearing recorded sessions of the abuse, there are no elegations only facts!! The next step is to find out WHY this man is escaping everything thrown at him and why nothing in 2 years has been done for the victim. ITS TIME TO GO VIRAL!!! MEDIA AND ALL RESOURCES WILL NOW BE USED TO FIND OUT WHY THIS WREAKS OF COVER UP SO BADLY!!!! Whoops. Looks like the strategy to wait until everyone forgets about it isn't going to work. Stay on it! Update me if you find anything out please. A former Glendale police sergeant has pleaded no contest to domestic-violence assault. 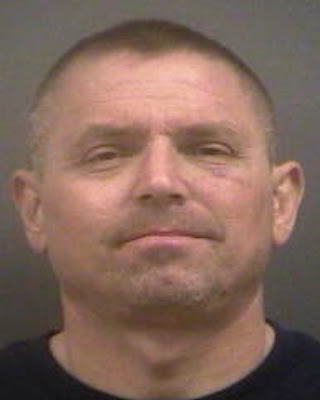 Brent Thomas, 43, was arrested in April after he allegedly assaulted his live-in girlfriend in Oregon and fled. Lincoln City police found dozens of loaded firearms in Thomas' home, which were not there when they returned to search the house. Thomas was barred from possessing weapons because of an order of protection filed by his estranged wife in Arizona. Thomas, a 14-year Glendale officer, resigned from the Police Department last November amid an investigation sparked by an anonymous report he had abused his wife. The couple were in the midst of a divorce when the allegations surfaced. Thomas' wife said he had abused her for years and shared pictures of her injuries. The Maricopa County Attorney's Office decided in February that it would not file charges against Thomas. Thomas, a former Glendale SWAT officer, later moved to Oregon. On April 10, police responded to Thomas' new home to find his 27-year-old girlfriend's face covered in blood and her eyes swollen, according to Lincoln County Circuit Court records. Thomas was held without bond in the county jail on suspicion of three counts of felony assault and misdemeanor counts of domestic-violence assault, menacing, strangulation and harassment. He also faced 71 misdemeanor counts of continuing to possess weapons. Last Tuesday, Thomas agreed to enter a no-contest plea for misdemeanor assault as part of an agreement with prosecutors. All other charges were dropped and Thomas has since been released from jail. Court records show the former officer was ordered to complete a batterer's intervention program, undergo an alcohol evaluation and to return his firearms to his estranged wife in Arizona. He will also be required to return police uniform patches seized during the investigation to the Glendale Police Department and to pay more than $11,000 in fines, according to records. Last month, Thomas agreed to permanently surrender his certification to serve as an Arizona police officer. It sounds like you know (and I'm swamped with cases involving murders) so any chance - since you can post as anonymous, that you could update us? Does anyone know where this guy is now cause I just had a guy by the same name, with an AZ phone # threaten me over text in TX? He runs an auto tinting and clear bra business in Argyle, Tx.